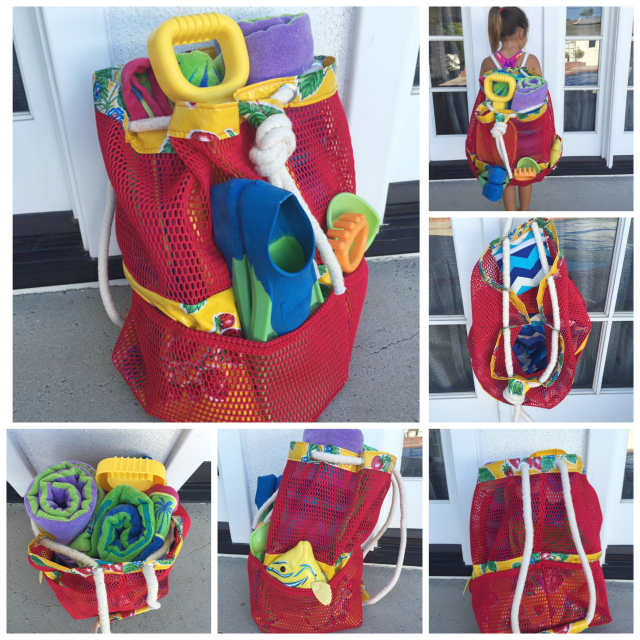 I introduced the Swim & Gym bag to you yesterday, and today I'm back to show you the testers' bags! 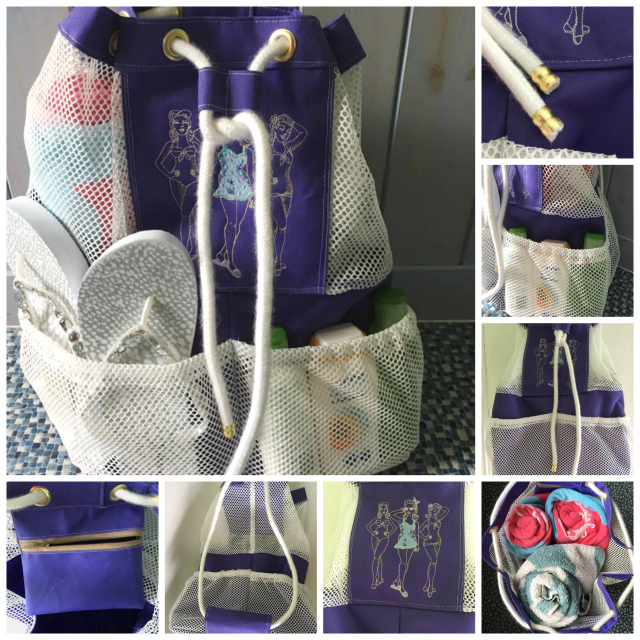 First up is Katie's bag, made in these really summery colours!! I love how Katie's styled her bag, it makes you want to just grab it and jump in the car for an adventure! 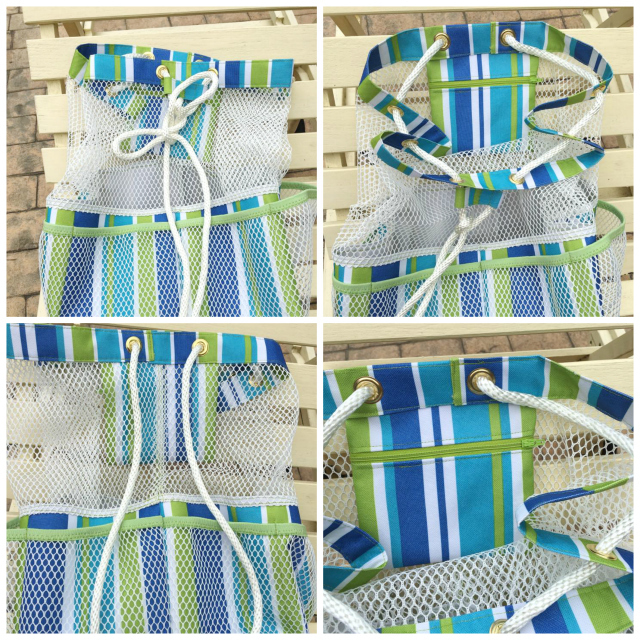 Next up is Pat who used this fun and fresh striped fabric, teamed with white mesh. She's chosen to do the fold over elastic along the top of the pockets and I love it! You can almost smell the sea salt in the air..! Maria chose to go a bit wild with her pattern, and made it up in patchwork cottons. Because the seams which would usually go at the side are at the front in this pattern, Maria changed her seams to the side, so has ended up with a different shape. I'll have a sew along later in the month with how to make yours out of faux leather and cotton if anyone would prefer that to mesh! Next up is Jayne who's made a lovely classy bag to take with her on her adventures, I love her blue polka dot fabric, it matches perfectly to the black mesh! 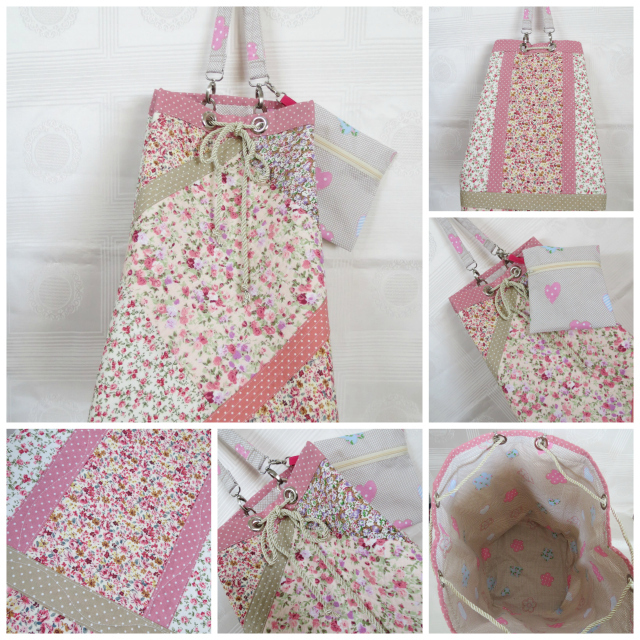 Christine is a new tester to Sewing Patterns by Mrs H, and she got stuck in to this bag in a big way! She made an embroidered panel for the front of the mesh, and used 'Olives' from the hardware store on her rope ends! Great job! 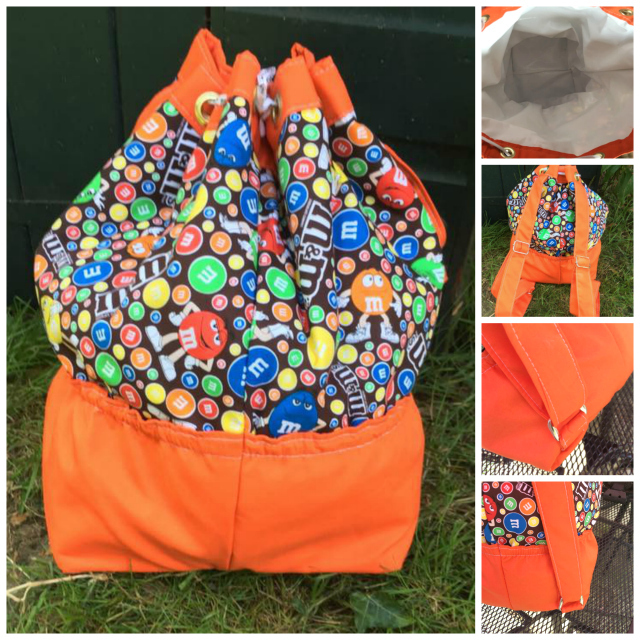 Then, never one to make a pattern just once, Christine had a play and made another bag from this fun M&Ms fabric! 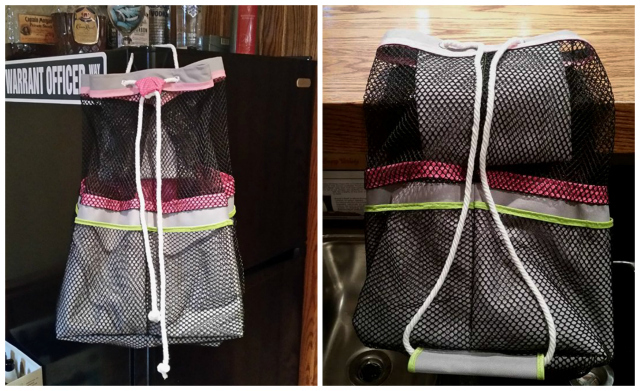 She added fabric backpack straps to this bag and lined it throughout with waterproof fabric. Deborah stepped away from making me a cocktail in her lovely bar (in her girl cave!) to snap these pics! She edged her grey outer fabric to prevent fraying, and I love the pop of pastel colour that gives! 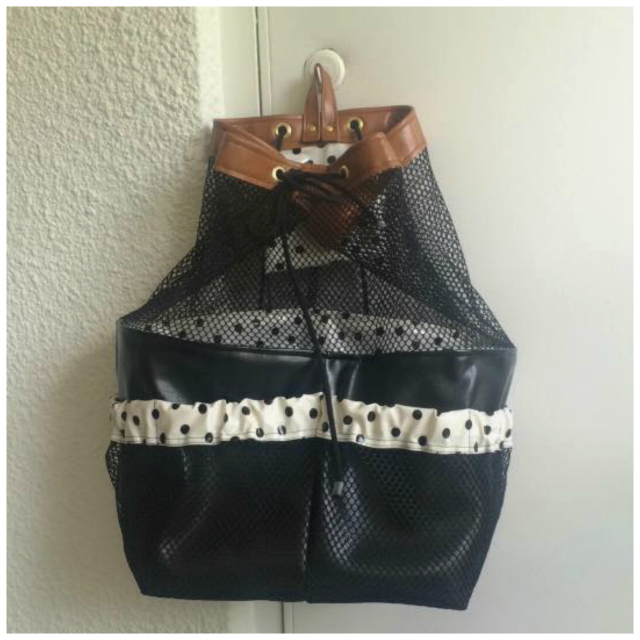 Crystal pushed the boat out on her bag and edged her outer mesh pockets with her waterproof lining material for a fun splash of polka dots! It looks so classy, and I love that hanging loop at the back! 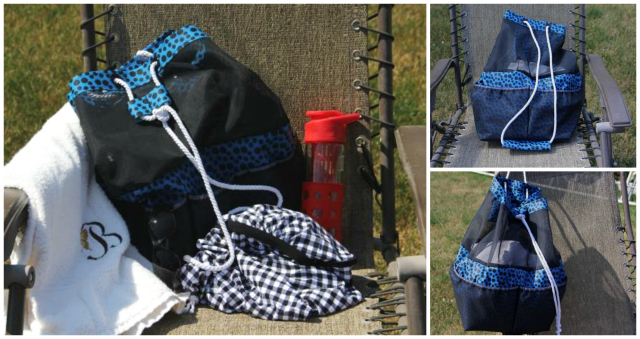 Lindsey used her splash of print as the bag base, with solid pockets and top! I absolutely love the print on that fabric peeking out! And finally, Maria made her bag in giant pink and yellow polka dots for a bag that's sure to turn heads!! 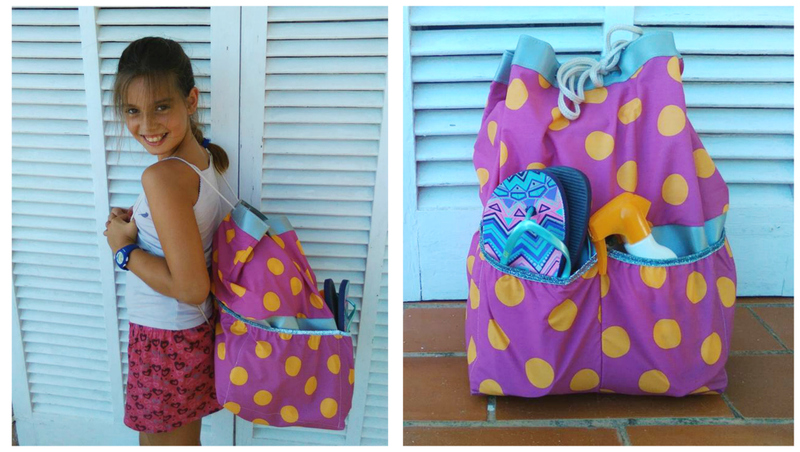 Her model looks pretty chuffed with her new bag and by the looks of it, she's ready for a holiday!